Almond comes with a cork band, the force lid (pantone 412c) and latte plug (pantone 7528c). 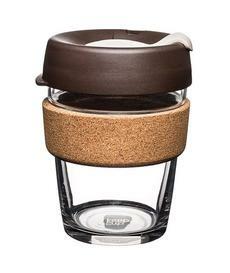 Awesome quality, looks great and so nice to drink a coffee ☕️ on the go out of a glass cup! Recommend. Love my stylish keep cup. Great product & grear price. Great product. Worth spending a bit more for the glass one. No plastic taste. Cleans easily. Loving it. Great. Love the cup and process of receiving it. Love it. First cup of this kind I've used that seems to add no extra metallic/plastic tastes. Love the look! The combination of glass and cork is both classy and functional. What ever we can do to stop using disposable cups, we should!